Long term trends for Buffalo Nickel values begin on this page. The Coin Value Tables provide numismatic researchers data on price movements from 1950 to the present for individual Buffalo Nickels across a wide spectrum of conditions. You may use the links directly below to navigate to dates of interest to you. 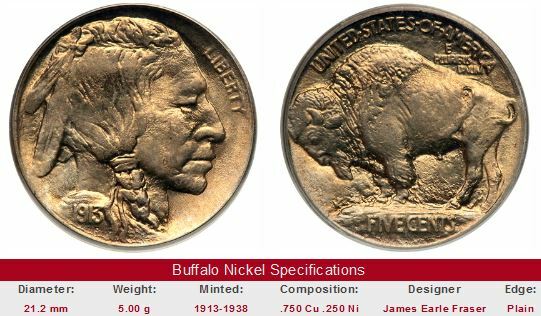 Buffalo Nickel prices 1913 through 1915 are on this page. The links for the 1916 onward will take you to another page. To learn about Buffalo Nickel history, we refer you to the introductory material for the Buffalo Nickels. Should you wish to study another US coinage type, then you'll want to return to the Coin Value Tables listing of online reports, or utilize the "Get Historic US Coin Values" option in the upper right hand corner of this page. In the 1950s, grading practices grading practices were radically different from what we have today. A coin's condition was described using simple adjectives such as "Very Good" or "Uncirculated". Accordingly, numismatic references of those times conformed to the same set of adjectives to approximate retail coin values. Varying distinctions of Uncirculated (today's equivalent of MS-60, MS-61, etc) and Proof were recognized in some advertisements and auction bills by employing modifying descriptors such as "Brilliant Uncirculated" or "Choice Proof", for example. However, with no clear point of reference or consistency on how the modifying descriptors were invoked, most publishers resorted to listing values for only one "Uncirculated" grade and one "Proof" grade. The 70-point numeric system (G-4, VG-8, etc.) in widespread use today was popularized by the American Numismatic Association in the late 1970s, an era when coin values were escalating dramatically, most notably for high quality specimens. Vague descriptors such as "Choice" and "Brilliant" were replaced by the more precise numerically determined grades. Thus, finely differentiated grades like MS-60, MS-63, and MS-65 eventually became commonplace, and by the late 1980s, the practice of assigning a numerical grade to indicate quality was universal (this does not imply the 70-point system eliminated grading inconsistencies, but it did help to stabilize the coin collecting hobby). The Coin Value Tables trend data for Buffalo nickels reflect the historic availability of numeric grades to describe coins. For the 1950-1985 rows, the values in the "G-4" column correspond to the "Good" listing of those years, "VG-8" corresponds to "Very Good", and so on. The "MS-60" column records the "Uncirculated" value reported during those same decades. Similarly, "PF-65" corresponds to simple "Proof" figures. Starting in the 1990 row, coin values strictly correspond to numeric grades grades. Furthermore, "Uncirculated" grades are broken down into "MS-60", "MS-63", and "MS-65", because by 1990, this type of Uncirculated value data for Buffalo nickels was readily available. Beginning in the 1990 row and onward, the "PF-65" figure can be precisely viewed as the value for a Proof nickel ranking 65 on the 70 point scale.